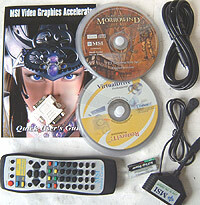 Abstract: The FX5200-TDR128 also has a large software bundle with three full version games. MSI's videocards usually have a lot to offer the end user a lot in terms of value. This contrasts many other manufacturers who either include an extensive software bundle and bump up the retail price a little, or strip the videocard down to the bare essentials and include absolutely no frills other than a really low sticker price. When we opened up the FX5200-TDR128 package and took a look around at what is included we found lots of games and useful software in addition to several other neat items. Still, the FX5200-TDR128 manages to maintain its aggressive price point. I guess it's not surprising that MSI are the number 1 videocard manufacturer in the world! Today we're going to be checking out one of MSI's latest budget videocards, the MSI FX5200-TDR128. 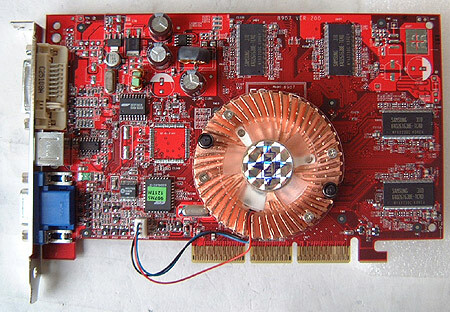 Based on the GeForceFX 5200 GPU, the card sports 128MB of 4ns TSOP-II Samsung memory, has TV-Output capabilities and even a remote control. Other hardware goodies included in the bundle are a DVI to analog adapter, S-Video to S-Video cable and a media breakout box. The FX5200-TDR128 also has a large software bundle with three full version games (Morrowind, Ghost Recon, Duke Nukem Manhattan Project), a seven game demo CD, WinDVD, VirtualDrive Pro and RestoreIt! Pro as well as three other miscellaneous CDROMs. 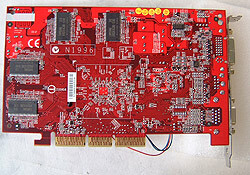 With a $175 CDN ($115 US) price tag, the MSI FX5200-TDR128 is about average for a run of the mill GeForceFX 5200 videocard. Not quite as affordable as the Albatron GeForceFX 5200P we reviewed a bit earlier, but the MSI comes with a heck of a lot more in terms of features! It seems like these days manufacturers distinguish themselves with the colour of their PCB's and MSI has been going using a red colour for a while now. MSI employs their "T.O.P. Tech II" cooling system on their FX5200-TDR128 and claims that it's more efficient at cooling down the GPU then other coolers while running quieter at the same time. Unfortunately we did not have a thermometer on hand here at the PCStats test labs but the back of the GPU on the MSI FX5200-TDR128 did feel cooler to the touch then the Albatron GeForceFX 5200P. That's not surprising though since the cooling on the Albatron card is entirely passive in nature. 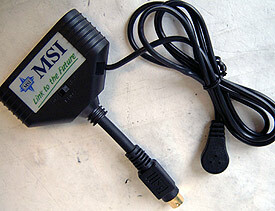 The remote control that comes with the MSI FX5200-TDR128 is certainly a nifty feature. However its usefulness needs a bit of work. Between the remote and receiver there must be a clear line of sight. If I put my hand in front of the remote, the connection between the two is lost. Because the MSI FX5200-TDR128 does not have a TV tuner, I think most of the really cool features of the remote are not that useful. Perhaps MSI should try their hand against ATi's All in Wonder line of videocards. Because this is nVIDIA's budget GPU we're not going to dwell on the performance enhancements with the more expensive cards. The NV34/GeForceFX 5200 GPU is fully DirectX 9 compliant like the rest of the GeForceFX family. According to nVIDIA the NV34 is the NV31 (GeForceFX 5600) on a larger die (0.15 micron as opposed to 0.13 for the faster GPU's) which operates at a slower clock speed. To help eliminate costs, nVIDIA removed special performance enhancing compression engines from the memory controller and that's why there's the transistor count difference. As you'll see in the benchmarks without the compression engines in the memory controller, the videocard becomes memory bandwidth bottle necked very quickly.